The armed conflict in eastern Ukraine, now entering its fifth year, has exhausted the local population. Civilians are hostages to a lack of political will, says a top official from the Organization for Security and Cooperation in Europe. They are also, he argues, the solution. Speaking March 5 at Harvard’s Davis Center for Russian and Eurasian Studies, Alexander Hug, the principal deputy chief monitor for the OSCE Special Monitoring Mission to Ukraine, emphasized that civilians are paying the highest price for the long-running conflict. Though the conflict in eastern Ukraine is often referred to as frozen, or even forgotten, the situation along the almost-500-kilometer frontline between government forces and the self-proclaimed separatist republics remains tense and unpredictable. Hug offered two explanations. First, over the last year both sides have moved their positions too close to each other into the supposedly demilitarized buffer zone. 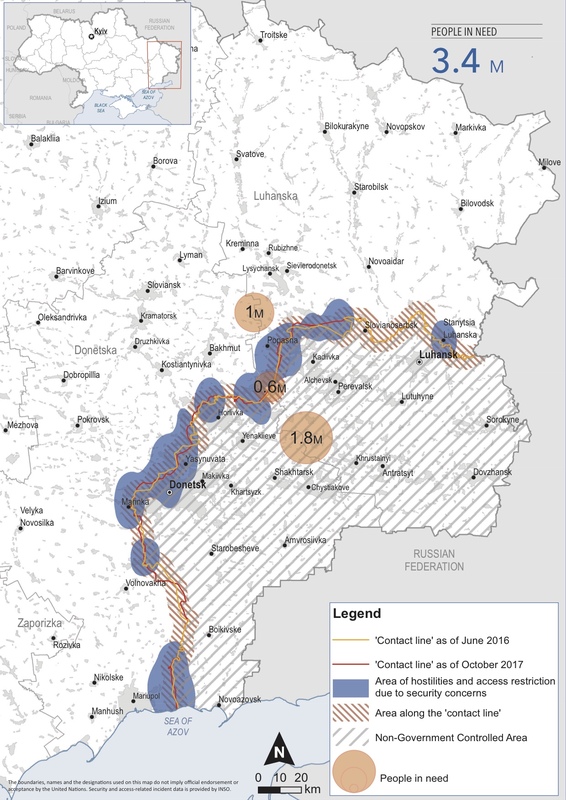 Second, in violation of the 2014 and 2015 Minsk agreements, the sides maintain heavy weapons at the frontlines. These constant tensions often descend into lethal fighting. Withdrawing heavy weapons from the front lines, as agreed in Minsk, would help the ceasefire hold. Violations of the Minsk agreements registered by the OSCE Special Monitoring Mission rise and fall. Occasionally the sides recommit to the ceasefire, typically due to external factors like harvest season, the beginning of the school year, or winter holidays. But these breaks are used by both sides to prepare for further violence: digging trenches, positioning more weapons. This boosts tensions and reignites a new cycle of violence. As a result, in 2017 the OSCE Mission registered even more civilian fatalities than in 2016 – 480 compared with 442. Twenty more civilians have already been killed in 2018. Apart from shelling – the main cause of casualties in this conflict – an increasing number are injured or killed from unexploded ordinances and mines scattered on the ground. According to a recent UN report, the region is rapidly becoming one of the most mine-contaminated areas in the world. According to Hug, only a political solution can end this humanitarian tragedy. It is not civilian-led: This is not a fight over religion or ethnicity. “It’s driven by political will. It is not something natural that happens because people hate each other. It [needs] conscious political decisions to continue. And [only] conscious political decisions can stop it,” he said. However, the singular political attempt to resolve the conflict – the Minsk process – has produced little change on the ground. The agreements (withdrawing from positions, demining, withdrawal of heavy weapons) have either remained unimplemented or have been only partially honored. However, Hug thinks it incorrect to argue that the Minsk process is dead: the ongoing talks provide channels for communication and potential solutions. “There is a process at the moment where everyone is more or less at the same table, where they have to look in each other’s eyes every second week. If there is a will, this process can be used to actually find the solution,” he said. Alisa Sopova is a fellow at the Davis Center for Russian and Eurasian Studies.